Can I Remove Shipping Info From my Store's Checkout? Some merchants deal exclusively in digital goods or other services that don't require shipping of products to the shopper. As such, a question we get often is whether there's a way to remove the store's "Shipping Information" sections from the final checkout pages. Unfortunately, we don't have a way of removing these sections without breaking the cart's functionality. 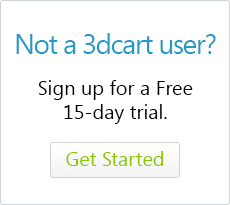 The 3dcart solution is mostly designed for merchants that handle both physical and digital items. However, if your store exclusively sells digital or non-shipped items, there are a few steps you can take to disguise these shipping areas so they aren't as apparent on the live store. This article will illustrate how to do this. Mark All Products as "Free Shipping"
The first step is to mark all of your products as "Free Shipping" in the Online Store Manager. This will make it so that your store uses its own pre-built free shipping module instead of relying on any created shipping methods for rate calculation. The next step would be to remove or disable any shipping methods present in the store. This will prevent them from displaying inadvertently and causing confusion to your customers. To do this, go to Settings ->Shipping and click "Select Methods" under Shipping Methods to deactivate (or remove altogether) any shipping methods present. Now, go to Settings ->Shipping and click on "Enter Settings" under Carrier Settings and click on the + Icon labeled "Shipping Settings." Once there, mark the checkbox labeled "Hide Shipping Preview" This will hide the Shipping Calculation Preview that appears on the store's "View Cart" page. Save the page. While in this section, make sure that the "Free Shipping - Domestic Only" checkbox is unchecked. This will ensure all orders are applicable for the store's free shipping. Next, go to Settings ->General ->Store Settings and go to the "Checkout" tab. Once there, look for the checkbox labeled "Billing and shipping address must match." Place a check in the checkbox and save your changes. This will tell the store to consider Shipping and Billing Addresses the same and will effectively hide the Shipping area form the checkout pages. This section contains every single label used by the store for everything from "Add to Cart" to areas where the label "Free Shipping" is found. In our case, we'll be editing the Shipping language spots to omit or otherwise disguise them as much as possible. The following is a list of some of the labels you'll want to change. We suggest using your browser's search function (CTRL-F) to find these in the language section. The label used for products pages when the product is marked as free shipping. Can be changed or left blank. The label used on the store's checkout pages to denote that the Free Shipping method is selected. Can be changed or left blank. The label used at the top of the checkout page (where shipping information is usually entered) Can be changed or left blank. This label is used on the checkout page to denote that Shipping address must be the same as billing. Can be changed or left blank. The label on the order subtotal that denotes the shipping cost of the order. Can be changed to meet your needs. These labels are used on the invoice screen to denote order shipping information when an invoice is viewed. At this point, the store will have the shipping references hidden or otherwise disguised to appear as something else. Any further changes to the look and feel will involve editing HTML templates which is not covered in our scope of support. However, if you would like to attempt editing it, the template is called "checkout-singlepage.html" If you would like to attempt editing the final Checkout page (also known as the thank you page); this template is called "checkout-step4.html"
While it is technically possible to perform the same changes using Mutliple Page Checkout on the store, we highly recommend using Single Page Checkout for this as it helps to further avoid confusion to your shoppers. Do I have to have a shipping method set up? What if I don't use shipping? Can I remove Shipping Options? Do I have to specify a shipping method?